Blade is a film and television franchise based on the fictional Marvel Comics character of the same name, portrayed by Wesley Snipes. They were written by David S. Goyer, based on the comics by Marv Wolfman, and Gene Colan. The three films were directed by Stephen Norrington, Guillermo del Toro and Goyer respectively, and distributed by New Line Cinema. The character was created in 1973 for Marvel Comics by writer Marv Wolfman and artist Gene Colan and was a supporting character in the 1970s comic Tomb of Dracula. In the comic, Blade's mother was bitten by a vampire while she was in labor with Blade. Meanwhile, in the urban underworld, a feud is started between "pure-blood" vampires and those who had been human, but were "turned." Blade becomes aware of this and investigates further, uncovering a plot to raise the blood god La Magra, something he must stop at all costs. The vampires succeed in framing Blade for the killing of a human (who was in fact a familiar being used as bait). Blade, now in the public's eye and wanted by the FBI, has to join forces with the Nightstalkers, a human clan of vampire hunters. 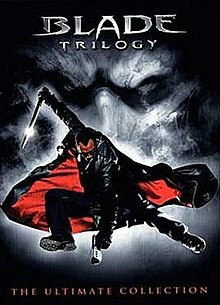 Blade, Hannibal King, and Abigail Whistler go after Danica Talos, who has succeeded in locating and resurrecting Drake, also known as Dracula, the first vampire and by far the most powerful. In order to stop him, Blade has to release a virus that will wipe out all vampires, but being a dhampir, he must face the possibility of also dying as a result. By August 2012, the film rights to Blade had reverted to Marvel Studios. In May 2013, The Hollywood Reporter reported that Marvel had a working script for Blade. At San Diego Comic Con 2015, Snipes told IGN that both he and Marvel were in talks about bringing Blade back to theaters. In 2016, Underworld actress Kate Beckinsale stated that Marvel was doing something with Blade, after she was asked about a crossover between both franchises. In 2006, Spike TV aired a thirteen episode series set before Blade: Trinity. ^ Kit, Borys (August 14, 2012). "Fox's Daredevil Rights on Verge of Reverting to Marvel as Ticking Clock Looms (Video)". The Hollywood Reporter. Archived from the original on August 15, 2012. Retrieved August 10, 2016. ^ Kit, Borys; Bond, Paul (May 7, 2013). "Marvel Cliffhanger: Robert Downey Jr.'s $50 Million Sequel Showdown". The Hollywood Reporter. Archived from the original on March 10, 2014. Retrieved May 8, 2013. ^ The Player: Wesley Snipes, Philip Winchester Interview - Comic-Con 2015. YouTube. July 10, 2015. ^ Snipes "In Talks" With Marvel About Blade Reboot - IGN News. YouTube. July 10, 2015. ^ Jayson, Jay (October 7, 2016). "Marvel Is Doing Something With Blade According To Kate Beckinsale". ComicBook.com. ^ "Blade (1998)". Box Office Mojo. Box Office Mojo, LLC. Retrieved December 4, 2009. ^ "Blade Production Budget". The-Numbers. Retrieved December 4, 2009. ^ "Blade II (2002)". Box Office Mojo. Box Office Mojo, LLC. Retrieved December 4, 2009. ^ "Blade: Trinity (2004)". Box Office Mojo. Box Office Mojo, LLC. Retrieved December 4, 2009. ^ "Blade". Rotten Tomatoes. Fandango Media. Retrieved December 4, 2009. ^ "Blade (1998)". Metacritic. CNET Networks, Inc. Retrieved December 4, 2009. ^ a b c "CinemaScore". CinemaScore. Retrieved November 18, 2018. ^ "Blade II". Rotten Tomatoes. Fandango Media. Retrieved December 4, 2009. ^ "Blade II (2002)". Metacritic. CNET Networks, Inc. Retrieved December 4, 2009. ^ "Blade: Trinity". Rotten Tomatoes. Fandango Media. Retrieved December 4, 2009. ^ "Blade: Trinity (2004)". Metacritic. CNET Networks, Inc. Retrieved December 4, 2009. This page was last edited on 7 April 2019, at 17:05 (UTC).